Whether you are preparing your house to be put on the market before a move or simply want to revamp your living space, a lot of people are realizing that their kitchen needs to be a focal point for home improvement. A full kitchen renovation can cost upward of $40,000, so I have prepared a guide to renovating this room on your own without needing to sell your car! These are all cost effective kitchen upgrades that won’t empty your wallet! Fresh flowers on your counter top provide an immediate impact on the appeal of your cooking space. Fruits that do not need to be refrigerated (such as apples and bananas) are in this category as well and would have the same effect. These fruits bring beautiful natural colors into your kitchen, and they will improve the smell in there as well. Kitchens without flowers or fruit often consist of a few neutral colors and everything matches. Fresh plants are a bright, easy and affordable way to spruce up your kitchen. When purchasing smaller appliances such as toasters and blenders, it’s imperative that you realize the full decorating potential that is available. Theme-specific small appliances are the small—and all-too-often—overlooked details necessary for creating your perfect kitchen. Swapping out your standard toaster for a certain color or targeting decorative versions is also a great way to update your kitchen without emptying your bank account! Another idea to make your appliance really shine is by using a stainless steel sleeve by using something like Faux steel. “These sleeves can be purchased online, and can be cut to exacting shapes for your appliances. You’ll need scissors, pencil, rule, squeegee, sharp knife, and a hairdryer to apply the material,” according to Home Stratosphere. The handles on your kitchen cabinets are a second area that is often over looked but can make large contributions to the overall look of your homes central area. The cabinet handles can have many different looks that can apply to any theme or color scheme. Wooden know handles are effective for a farmhouse style kitchen where stainless steel may be a better option for more modern looking kitchens. The faucet on your kitchen sink is remarkably easy to change, and replacement faucets are not over the top expensive. This is why I think that replacing the faucet at your sink is another easy and cost efficient way to improve your kitchen. Faucets are available at most home improvement stores and usually come with simple instructions for making the switch! The lighting in your kitchen is a major determinant of the overall atmosphere. Installing hanging pendant lamps over an island, or adding a modern lighting fixture can make a huge difference even without the smaller details already discussed. “Task lights” are very trendy right now and inexpensive at large retailers. The lights installed by the contractor are usually bland and low quality making this upgrade an easy decision, with lots of creative freedom! Standard cabinets in new homes are all very similar. They have outward opening doors and are all a neutral wood color. While they start off the same, people often fail to realize how creative they can get with the cabinets. Taking the doors of the cabinets completely, or replacing them with glass, is an easy way to make your kitchen uniquely yours. Painting over the wood of your cabinets also poses a lot of opportunities for differentiation. The worst mistake you can make is replacing cabinets that don’t have the look you want. Usually it is achievable with the standard cabinets but you may have to think a little outside the box. 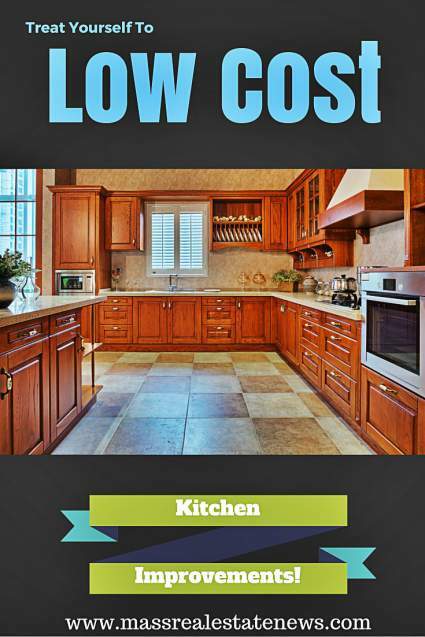 If you have a slightly larger budget you can opt for some of these luxury home kitchen ideas shared by real estate expert Anita Clark. The counter space is yet another area that is often left as it came by the contractors. While it is more expensive then the other upgrade ideas so far it can also have the biggest impact. A hardwood counter top covering your island is a great way to tie in more of the wood color already found in your cabinets. Even if you have decided to paint the cabinets, this counter top could be painted to match and still provide utility as a cutting board. The most popular route by far but certainly the one that would be near the top of most buyers desires is installing granite counter tops. Granite just has a way of adding some real pizzazz to a kitchen.While granite is a little more expensive than some other potential counter top selections, it is one of the top choices of home buyers and can really add some serious punch to your kitchen! Kitchen floors come in many varieties of materials and looks. Tile is a very popular option and if you have a tile pattern you are particularly fond of, you can buy extra and put it on the wall as a backdrop behind the sink and under the cabinets. If you are not in love with your tile, linoleum is a low cost option that comes in many colors and patterns. If you are willing to make a larger investment in your house then hardwood floors or more expensive tile are other options as well. One of the best low cost home improvements that will add the biggest bang for your buck without breaking the bank is painting! Changing the color of the walls in your kitchen can make it feel like a brand new room. The kitchen is an area where people are often more willing to be bold with wall color choices, which makes this a very fun project. Once you have decided on the counter tops, cabinets and floors you can decide what color works best with your new kitchen and really bring the new room to life! If you are worried about your kitchen being out of commission for too long then just call these one-day painters! One of the most expensive suggestions for upgrading your kitchen is updating your appliances. There are many different looks and styles of large appliances available to choose from and this upgrade would have also have a positive impact on your home’s resale value. The appliances in a kitchen can make it feel years older then it really is if they go far too long between upgrades. Stainless steel and dark appliances are very popular right now and make a kitchen feel much more modern. Use the new appliances to match with your upgraded lights, cabinet handles, small appliances and really pull the whole kitchen together. Then, just hire a construction clean out service to take care of the trash! The wall space behind your kitchen sink and underneath your kitchen counter can be greatly improved by adding a tile back splash where there was only solid color paint before. Adding the back splash can be done by yourself and is a fun project for those looking to ramp up the value of their home. The reason many consider it fun is because you have the opportunity to decorate as you please. Find a tile that you feel matches the design of the house. Then find an easy to follow do it yourself guide and you can improve the aesthetic appeal of your kitchen without emptying your wallet. Making all these cost effective kitchen upgrades will not only change the appearance of your kitchen dramatically but you won’t feel that buyers remorse some people get having spent a lot of money. About the author: Matt Lawler is an Internet marketing specialist from Tempe, Arizona where he attended Arizona State University. Whenever he can step away from the computer, Matt enjoys playing sports, traveling and exploring the great outdoors. Kitchen upgrades through a completely different sets of eyes. A few weeks ago I was speaking to a prospective home seller in NYC. She said it would cost over $150K for a nice makeover. She’s thinking Rolls Royce style but I was suggesting a Honda Accord kitchen makeover. These are great additional tips I will share with her. Thanks for sharing Bill, and Matt Lawler. Good Point, Marty. I experienced the same thing – they had already purchased over the top appliances, so I was trying to find ways for them to save some $$ in the rest of their kitchen remodel and will definitely share this blogpost with them.